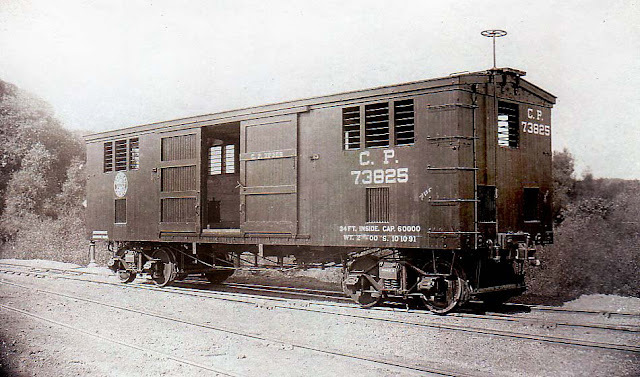 An early photo of the SP system's 34-foot combination boxcar. 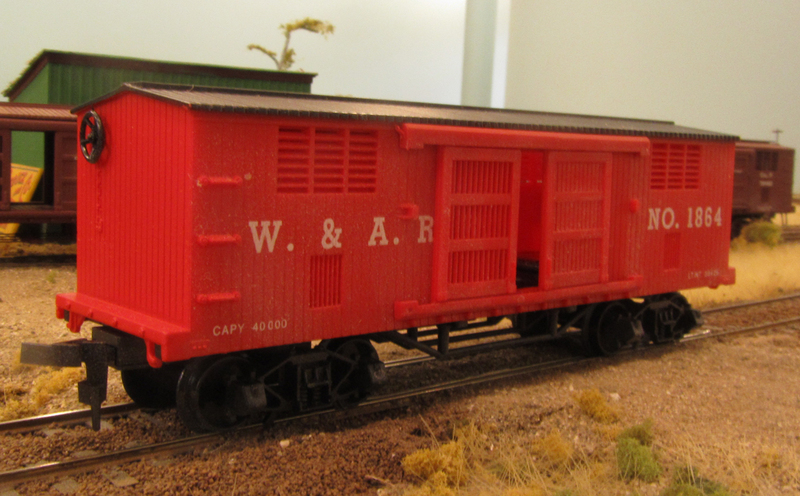 AHM/IHC's version of the combination boxcar. 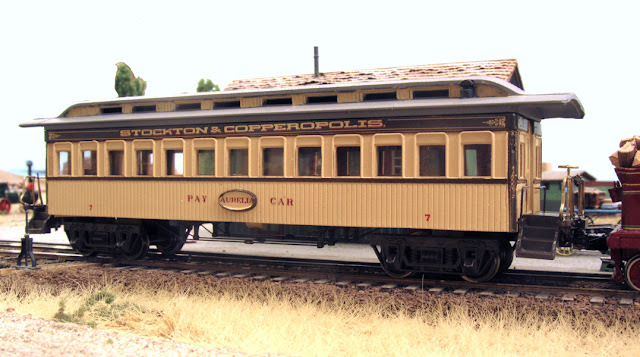 The term "combination" as applied to boxcars meant a universal car to the folks at the Central/Southern Pacific. It came equipped with various barred openings in the sides and ends which could be closed by internal sliding doors. Close the doors and you have a secure and weather-tight car. Open the doors in various combinations and you had a stock car, a ventilated fruit or produce car or a car suitable for carrying flammable liquids. In the latter case, the lower doors allowed any vapors from leakage to be blown out of the car rather than accumulate. I chose to model four cars for my railroad, one each lettered for the Southern Pacific, Central Pacific, Oregon & California and California Pacific. Fortunately, AHM and, later, IHC produced plastic cars based on this prototype. The cars are generally crude and do not have the end doors so some modification was needed. the openings closed by the inner solid doors. To make my cars, I removed the truss rods, molded-in brake staff/chain and cut three square holes in each end of the car. The bars on these openings were made from .020" styrene rod. Nylon fishing line truss rods with Grandt turnbuckles were installed along with Cal-Scale brake wheels. The grab irons were 23" and 18" preformed pieces made by Westerfield. In this period, the SP used a one-piece grab-iron which wrapped around the end of the car to form both the side and end irons. I used the Westerfield irons installed with Art and Adrian Hundhausen's (Silvercrashcarworks.com) method to try and get the proper appearance. Intermountain wheels replaced the plastic wheels which came with the car although the truck frames were used. 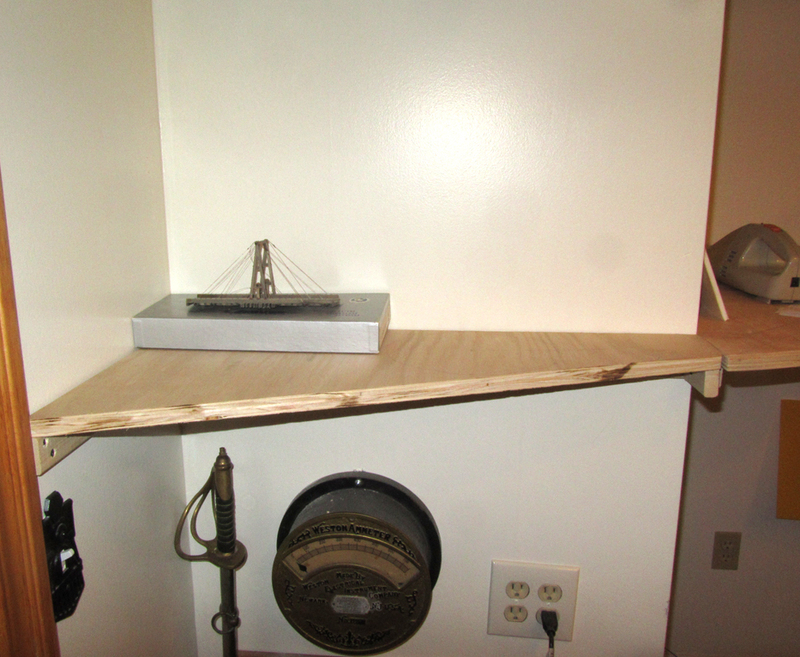 The end result is not an exact copy of the prototype but it works for me at least for now. 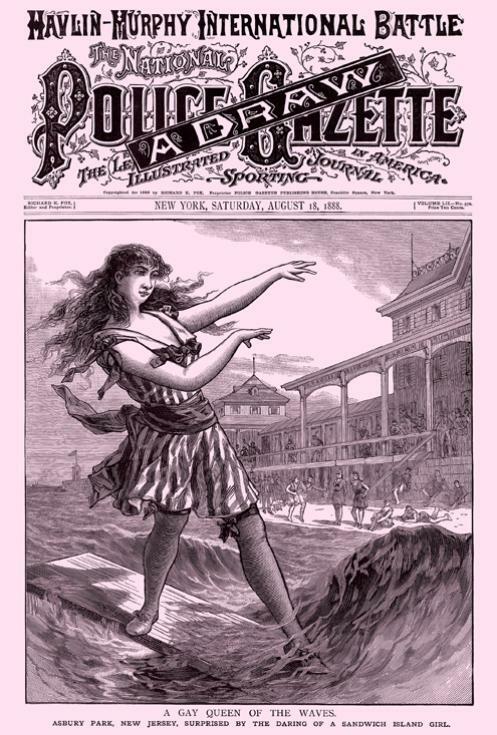 In 1895, there were few of the 34-foot cars compared to the 28-foot cars. Although Mantua/Tyco made a car similar to them, my version, when I get around to making them, will have to be scratchbuilt. Another project for another time. The C.A. Coscia stands at the Oakdale depot awaiting an assignment. The striping is based on the prototype C.P.Huntington at the California Railroad Museum. I've been wanting to get this little engine running for some time now. One reason is that I just happen to like single-driver locomotives and another was to see if I could get sound into it. For those of you who might not recognize the engine, it is a model of the Southern Pacific's No. 1 (formerly Central Pacific No. 3), the C. P. Huntington which still exists in the California Railroad Museum. The model was imported in brass by Key in the 1980s. 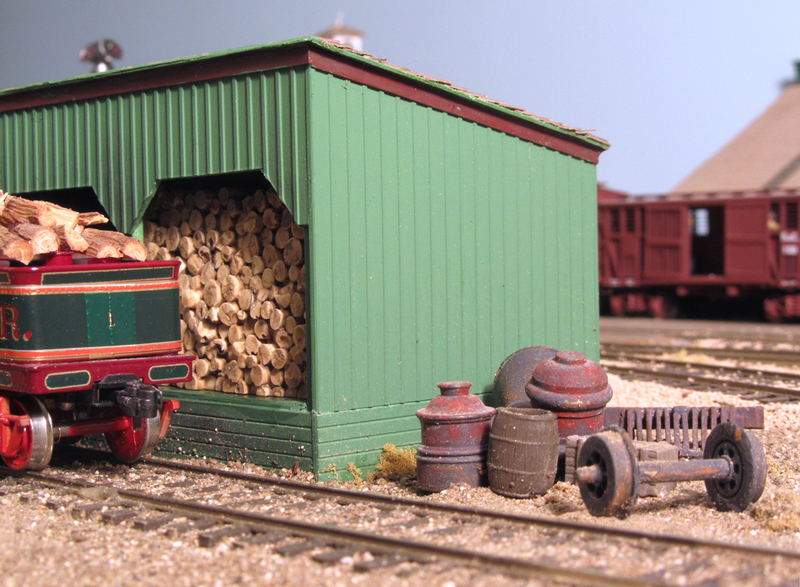 The woodpile in the tank area almost entirely hides the speaker glued to the underside of the roof. The decoder is located in the cab. The prototype Huntington once sported a rear headlight such as this one. To get it running, I had to modify the rear end beam. 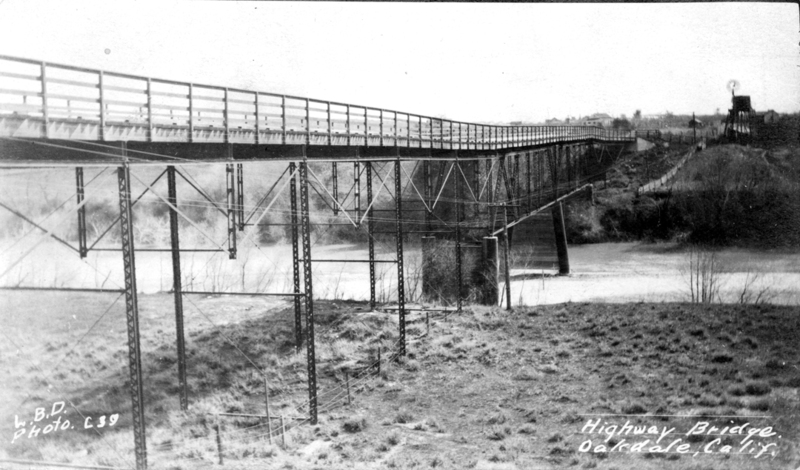 The original was just a brass casting with a simulated link-and-pin drawhead. I drilled that out and substituted a Kadee 711 coupler. 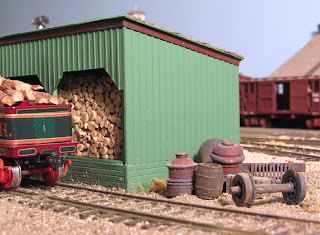 A number plate was added to the smokebox cover as well as a light for backing moves. The rest of the engine was left stock. sound despite its tiny size. 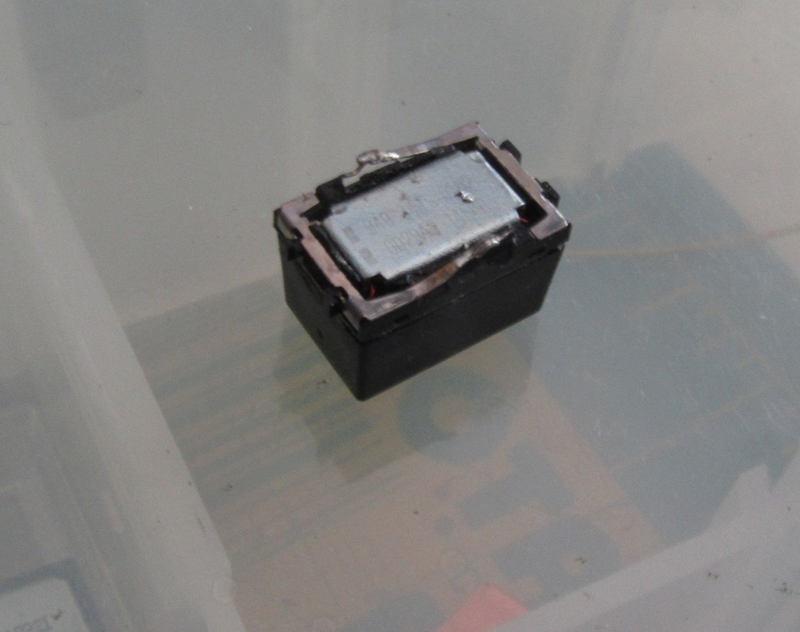 A Loksound Select Mini decoder was used for the sound along with a Zimo 8x11 mm "sugar cube" speaker. The decoder barely fit into the cab with the speaker glued under the roof. 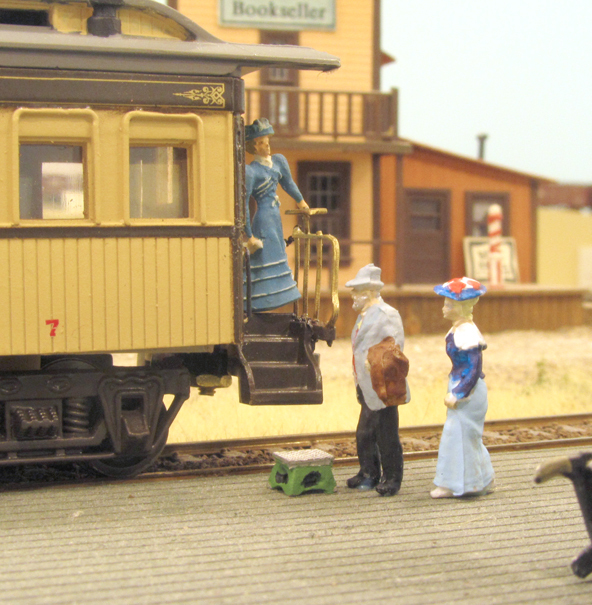 These little engines won't run reliably unless extra electrical pickups are added. A wiper made from .010" phosphor bronze was attached to run on the insulated driver and track sliders were attached to both the left and right side pickups. I would like to have added more but the size of the engine made that difficult. 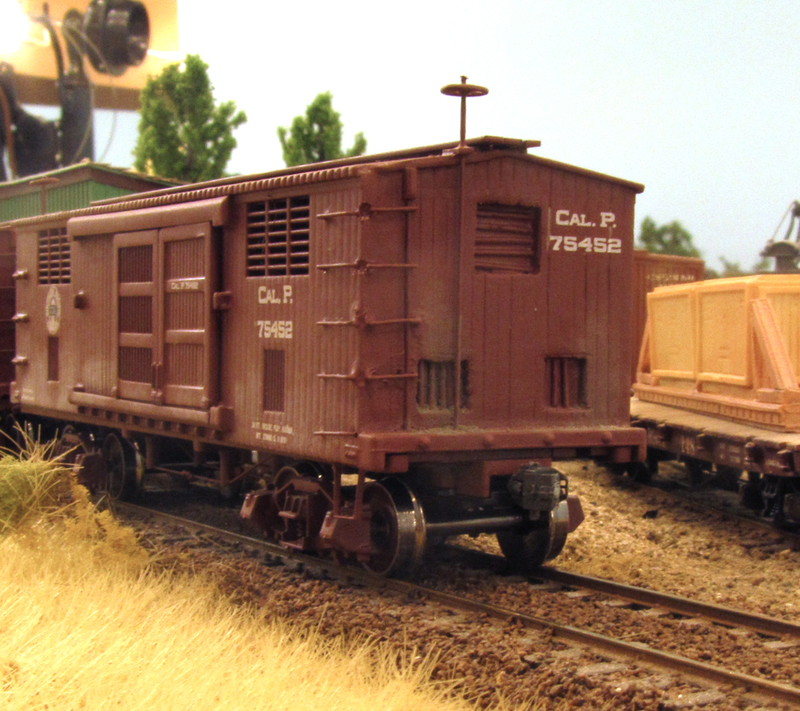 All in all, the loco runs pretty well and can pull two or three freight cars. 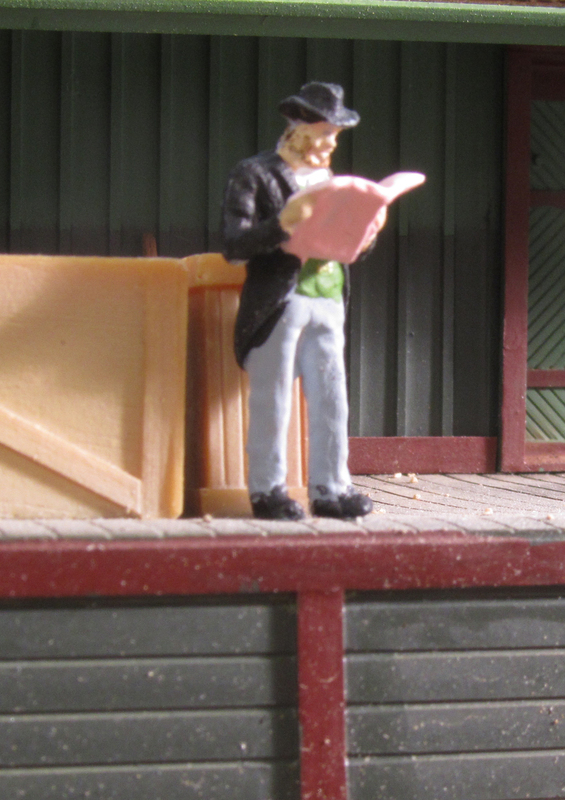 Since that's all the prototype could do, I am happy. My intention is to use this engine to pull the pay car once I get one built. More about that operation later. 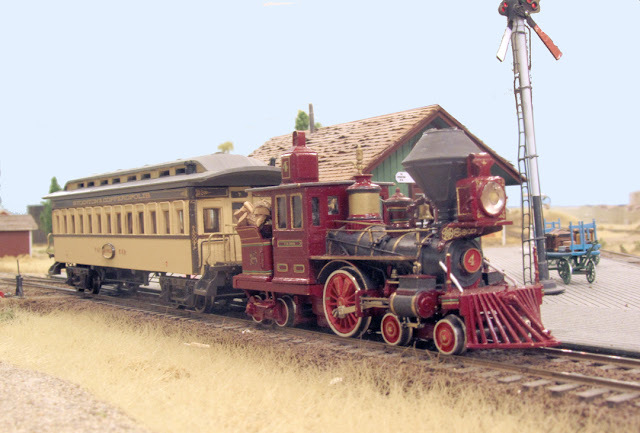 About one passenger car is the limit for this locomotive but this is all that would be required to pull the pay car. 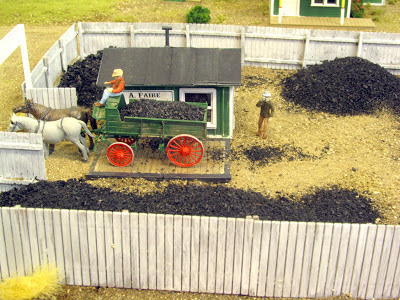 The worst part about the single-driver models is that any little defect in the trackwork can affect the engine. Most engines have at least one other pair of drivers to push them over rough trackage but the singles do not. The drivers spin and nothing happens, sort of like getting one of your rear car wheels in a mud puddle. It spins fast but the car goes nowhere. 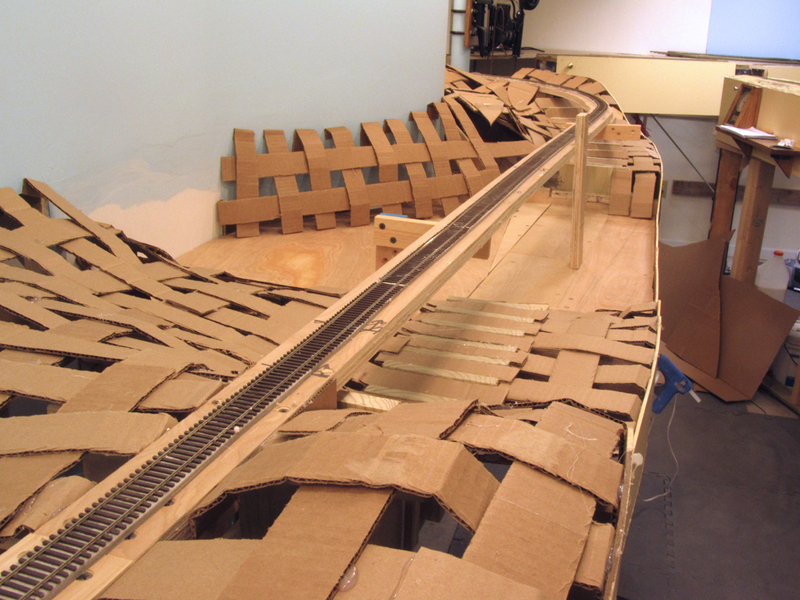 The good side of this is that you now have an engine to inspect the track so you can repair it. 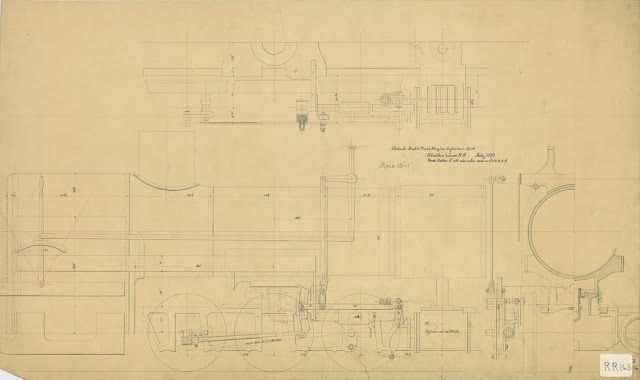 The engine that pulled the pay car was kept in excellent condition as it represented the fiscal solvency of the railroad and upper management. I've tried to get that feeling into this one. It's named the C. A. Coscia after a good friend and supporter of the S&C. Open for business! 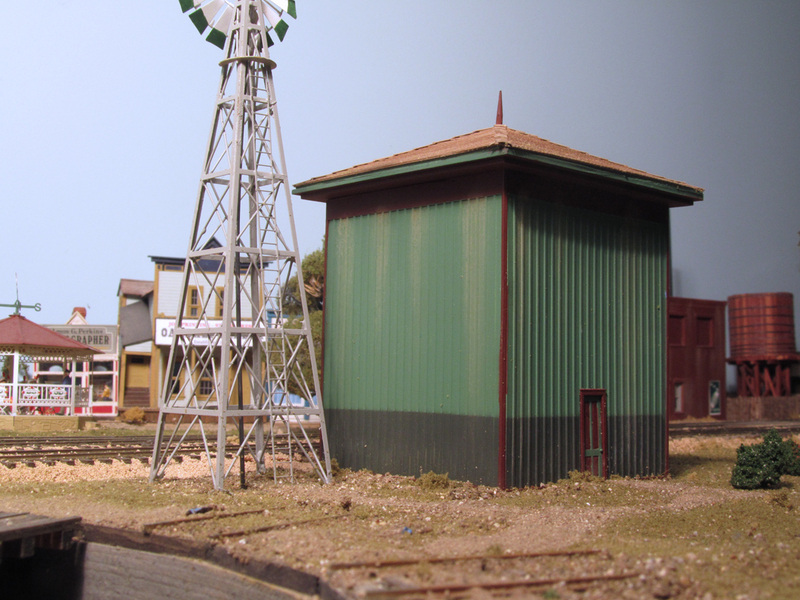 The small building to the right is the factory and offices while the building on the left is the warehouse. Thirsty Oakdale citizens can now rejoice as the A. W. Moulton Soda Works is now open for business! 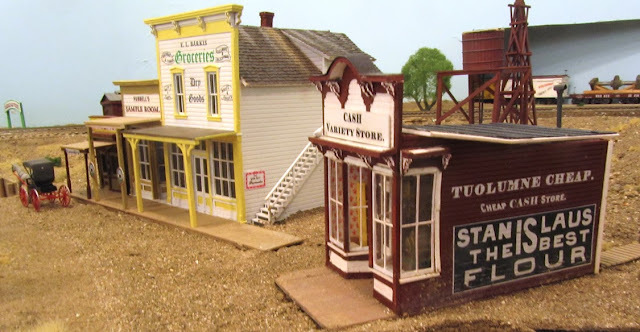 In small town throughout the country during the nineteenth century, soda manufacturing was as ubiquitous as the brewery. Although the standard drink for men was beer or whiskey, the younger set, and the teetotalers, needed refreshment as well. The carbonation process was simple and many of these soda plants lasted into the 1930s until the competition from Coca Cola, Pepsi and other big manufacturers put them out of business. Barrels of sulfuric acid and limestone as well as flats of finished pop are stored on the loading dock. The Moulton works lasted into the 1890s after which the building disappeared from maps, presumably from fire. The Oakdale Soda Works filled the vacuum shortly thereafter and lasted in the 20th century. 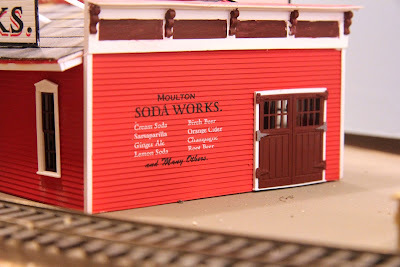 While I had building dimensions from both railroad and insurance map sources, there were no photos available so the Moulton works is the right size but not necessarily the right appearance. 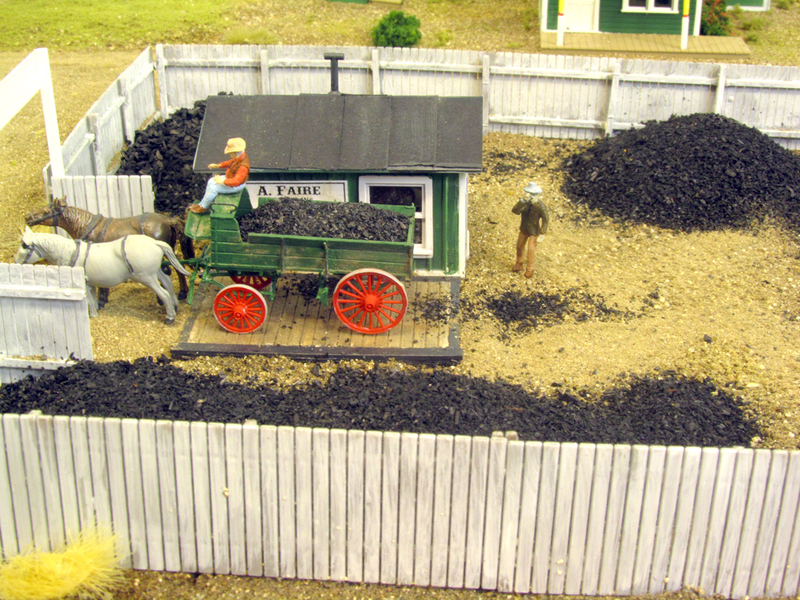 The prototype was rail-served and provides opportunities for shipping in quantities of limestone, sulfuric acid (yes, those were was part of the process) and glass bottles. Cases of delicious soda, pop, or just coke, depending on what you want to call it, would be the outbound products. 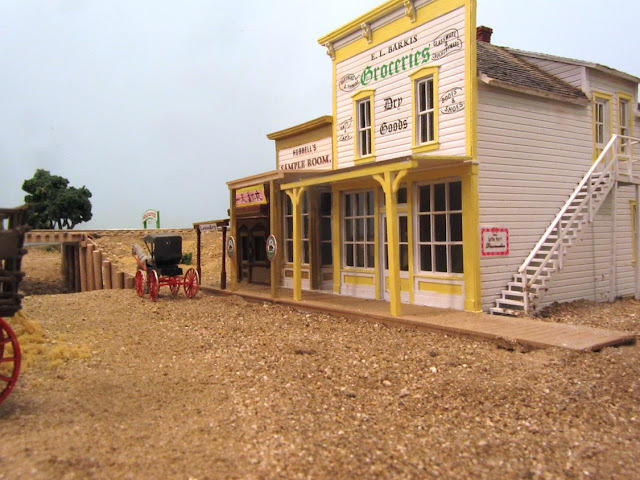 Although the main part of the building faces the railroad spur, the building is at the end of a peninsula and can be seen from both sides. This would be the street side with a road that will eventually run in from of the factory. 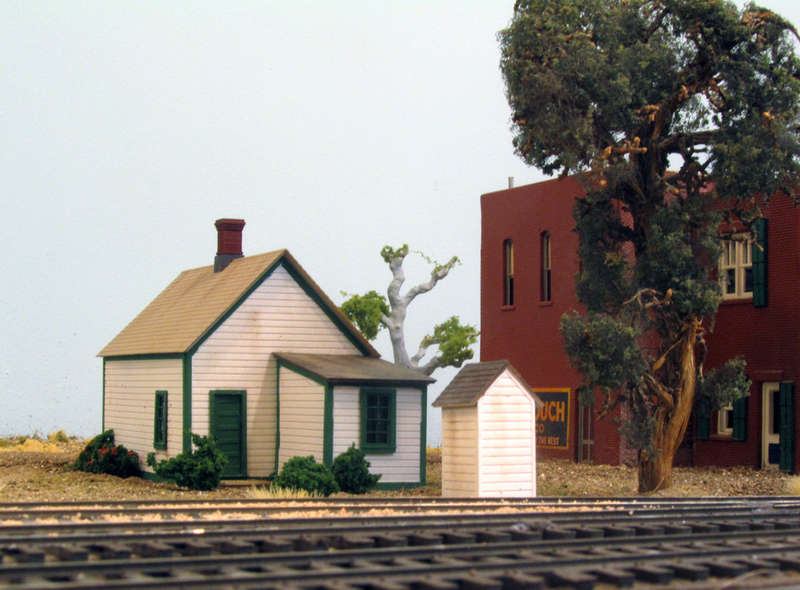 The building is constructed of styrene with Minuteman Scale Models shingles and rolled roofing. The lettering was printed on an Alps printer from my artwork. The barrels, bottle flats and bottles are from Preiser. 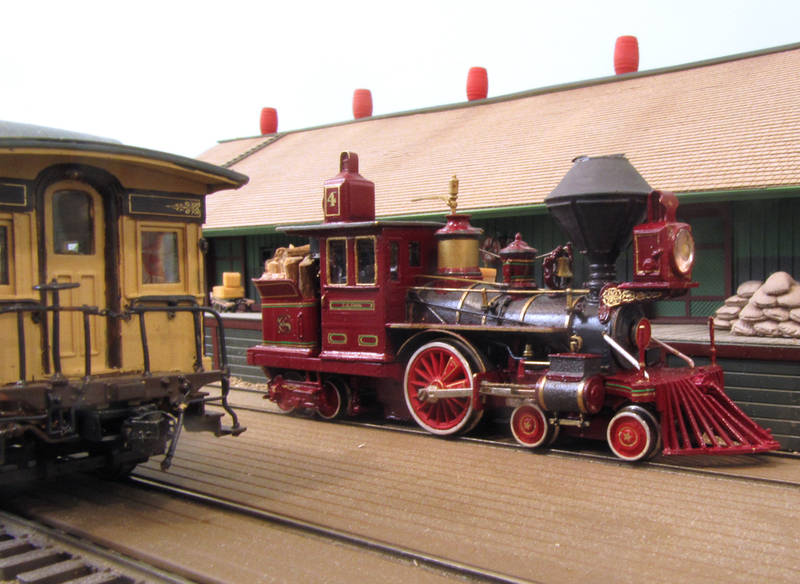 The new Stockton & Ione locomotive is now in the yard at Holden. Although the narrow gauge Stockton & Ione Railroad is not a major part of the S&C project, I would like to make some progress on that part of the layout. 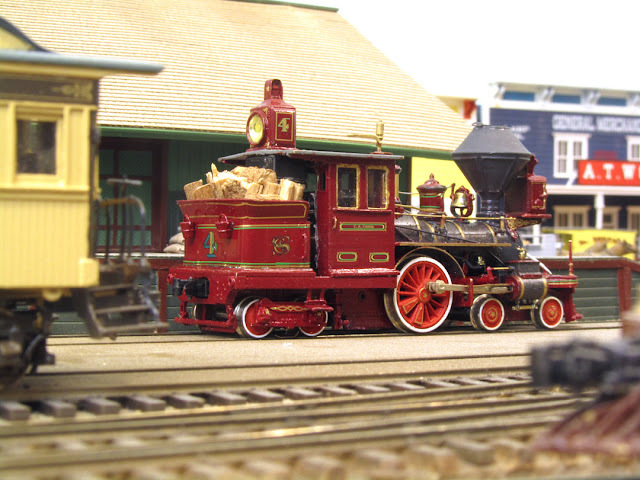 Last month, when my wife and I were in Durango, Colorado, I visited Soundtraxx where they showed me their new quasi-1890s locomotive. It's based on their C-19 locos but somewhat backdated with a diamond stack, era-correct smokebox cover and Russian iron boiler jacket. It's not truly correct but they have been testing the waters for older equipment and have found the market receptive. It's really a nice smooth-running engine with a lot of possibilities so I bought one for the S&I. 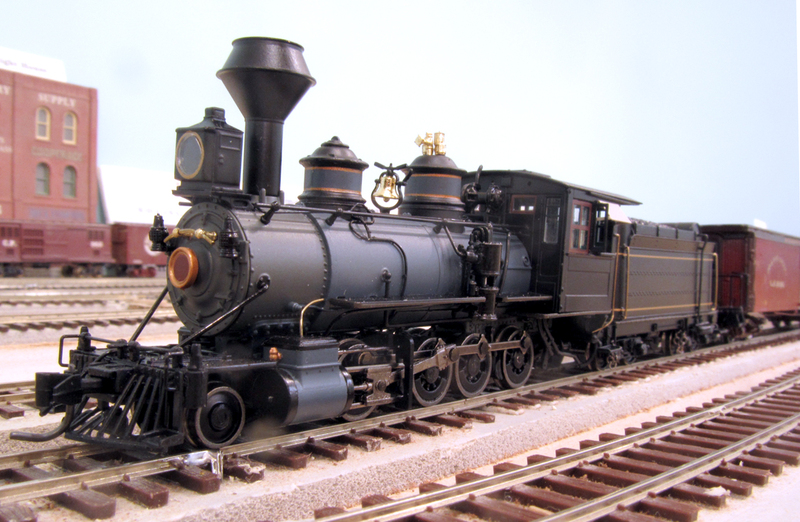 My plans for the loco are to shorten the smokebox, remove the dynamo, relocate the air pump and tender air cylinder. 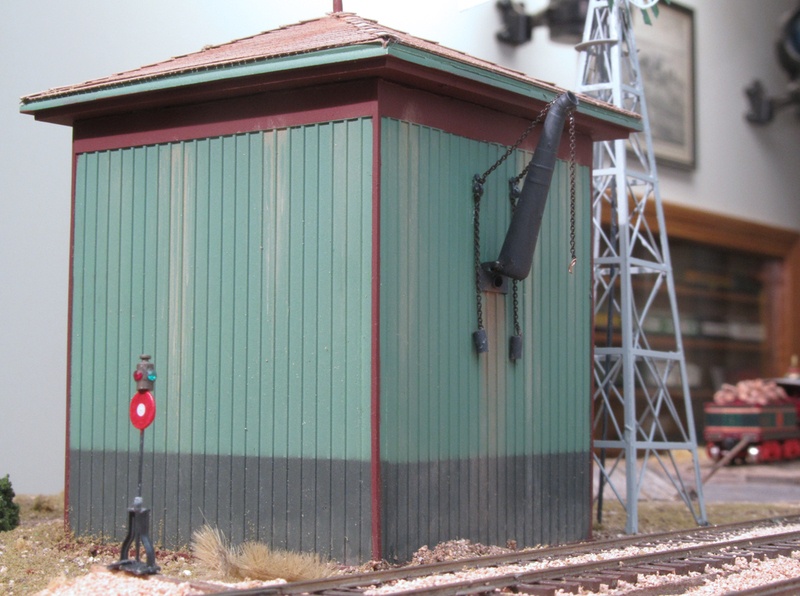 I may possibly add an older cab and more rivet detail on the stack. The S&I only had two locos in its short life and neither were 2-8-0s but neither did it get all the way to Ione. 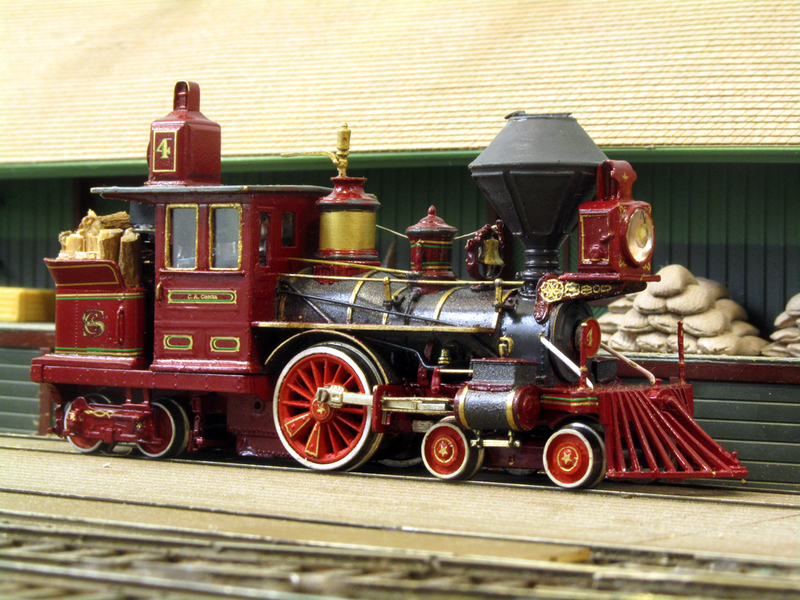 Using this and another original Mason drawing should help recreate the S&I locomotive Amador. Speaking of S&I locos, I also managed to locate two original drawings for the S&I engine Amador. 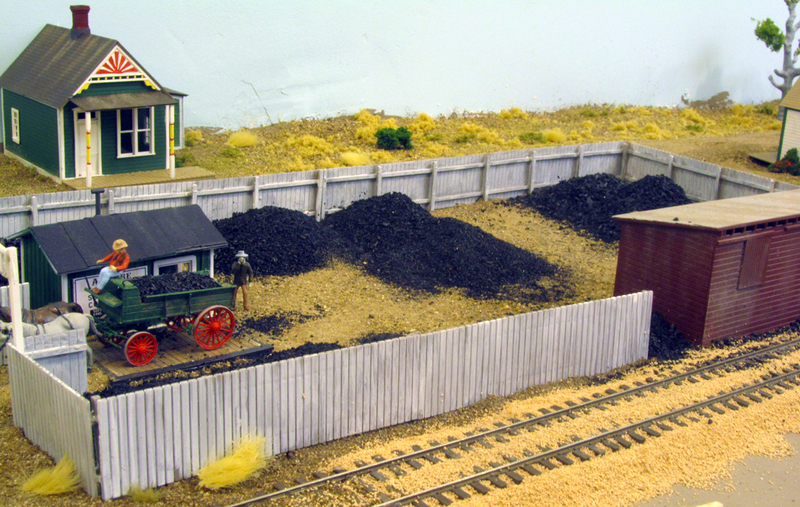 It was an 0-6-4T Mason bogie. This was a great find as I don't have any photos of this loco as the Amador and the boiler is a bit different than what I thought it would be. Code 40 and 55 flex track is being amassed adjacent to the almost-abandoned S&I grade east of Holden. The National Narrow Gauge Convention is going to be here in Kansas City in 2014 and the committee asked to have my railroad on the layout tours. 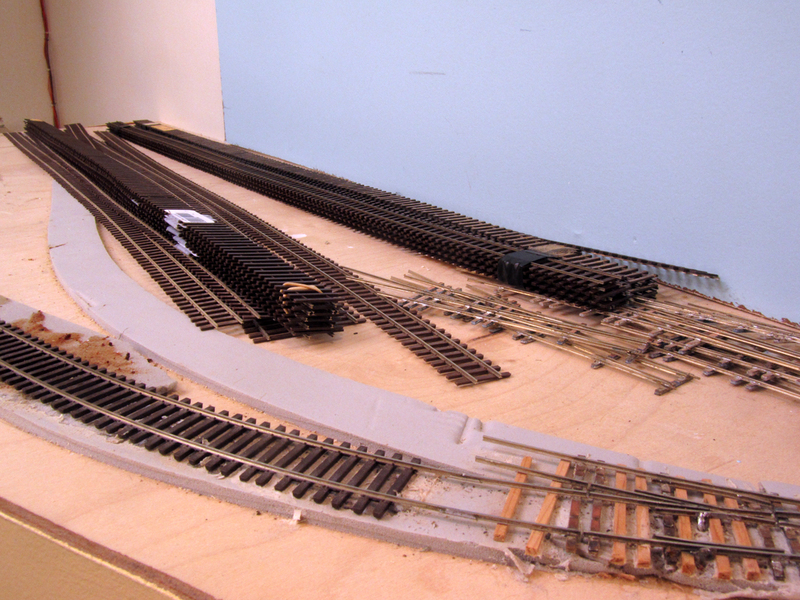 I agreed and decided that I should get at least some operating narrow gauge on the layout so, as the Stockton Daily Independent said "Rails and ties are being stockpiled at the S&I junction switch east of Holden. 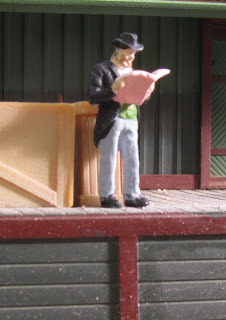 It looks like the narrow gauge project may still have some life in it." These new structures are all patterned after Oakdale businesses of the 1880s-90s. 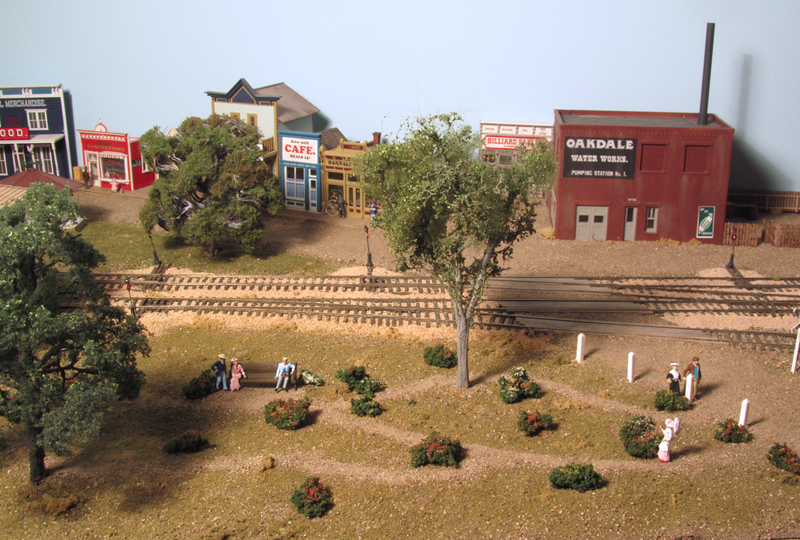 J street was the southernmost street in Oakdale and there really weren't many business down there. 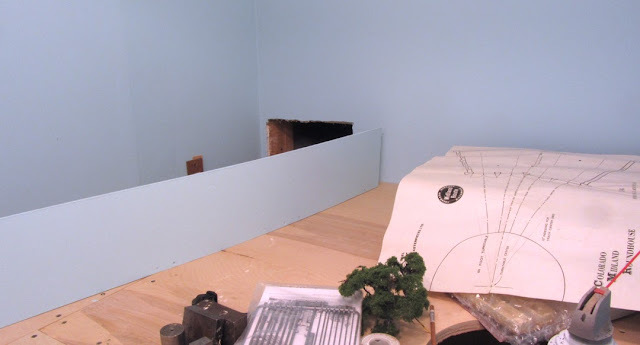 The railroad, however, had a gap which just had to be filled. I delved into my supply of kits and came up with a couple of good ones. They are all patterned after businesses that were in Oakdale during the 1880s and 1890s. The first structure, the Tuolumne Cheap Cash store was covered before in my post of August 12, 2012. The next in line is Barkis's Dry Goods and Grocery store. The lettering was copied from a photo of the prototype structure and the building did indeed have the fancy Old English style font. 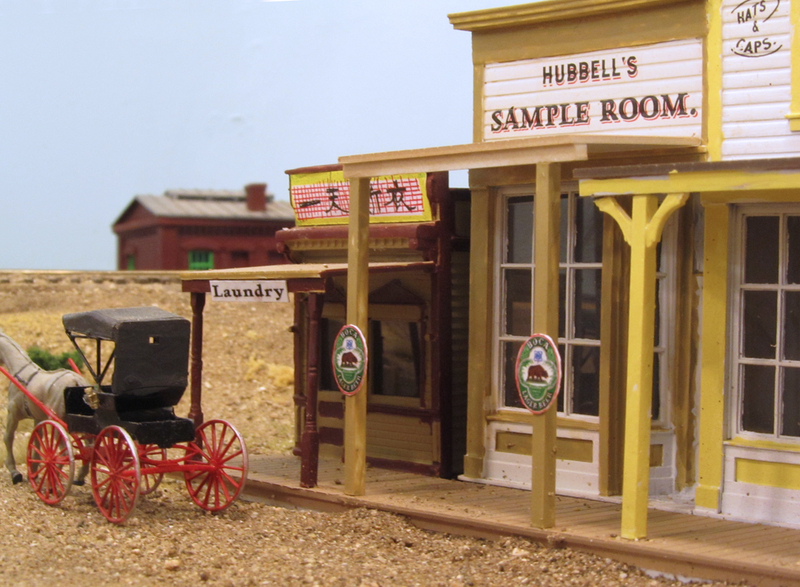 That business and the adjacent Hubbell's Sample Room were from Main Street Heritage kits. 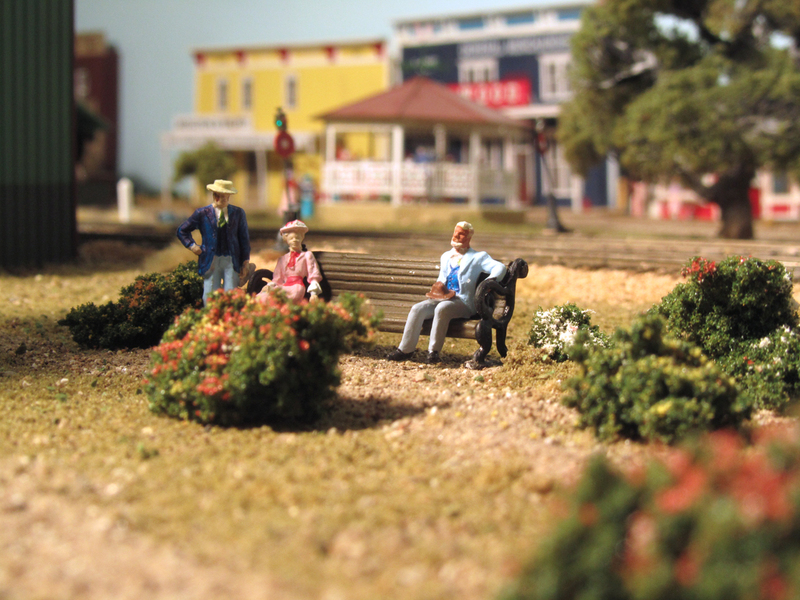 The final structure is a Woodland Scenics building which translated into a Chinese laundry. The second floor of the Barkis building is occupied by the Barkis family plus a single lady, Lotta Kerr who is a dressmaker. Yes, Miss Kerr was a dressmaker in Oakdale. The two signs on the porch posts advertise Boca Beer, a very popular California brew in the 1890s which was sold by Mr. Hubbell. The Chinese characters do proclaim the building a laundry. They came from a sheet of Chinese signs which wording I had verified by a Chinese gentleman with whom I worked. In the nineteenth century, another euphenism for a bar was a sample room. The name, I suppose, added some gentility to the occupation. There is a photo in my collection of Mr. Hubbell standing outside of his establishment adjacent to two Boca Beer signs similar to those on the model. The laundry is freelanced. 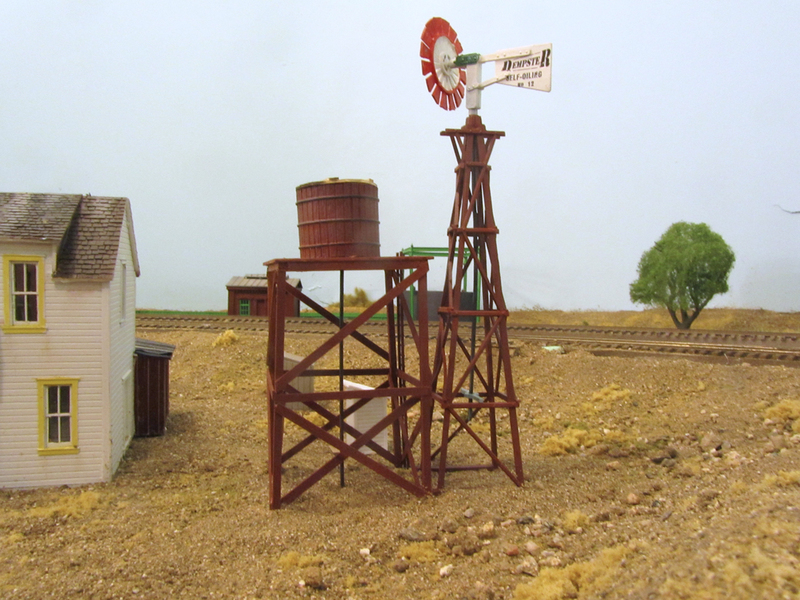 A Dempster windmill pumps water to the small tank which supplies the needs of the residents on this block. 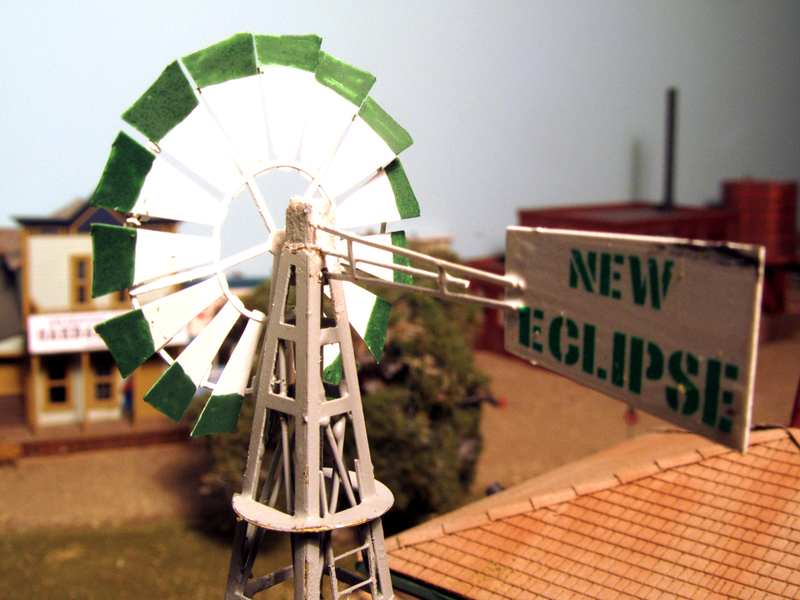 Since windmills show up everywhere in photos and on insurance maps, I had to add a few. 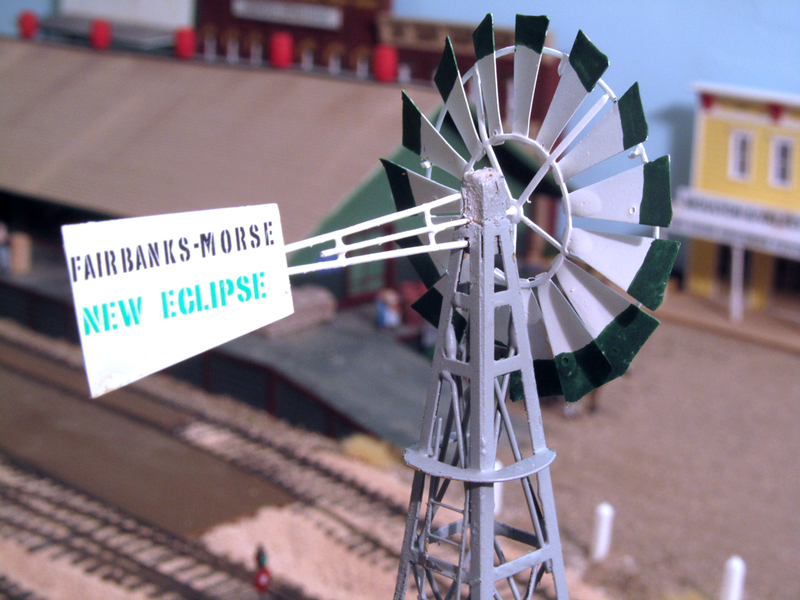 This one was built from a Vista kit to which I added the Dempster lettering based on the prototype Dempster mills. 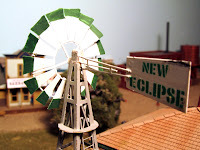 My research has led me to looking into windmill manufacturers. They all had their own colorful designs with their names painted on the vane. 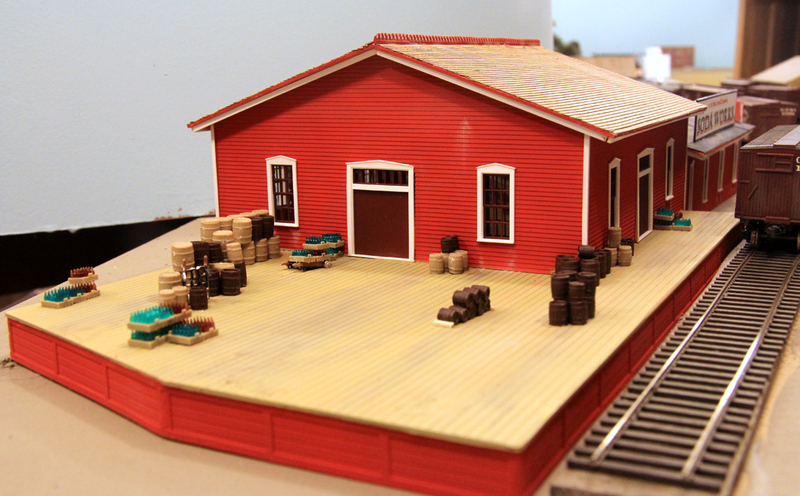 The railroad will include a number of different manufacturers as I continue to build them. More oak trees need to be made and planted. That will be the next project. 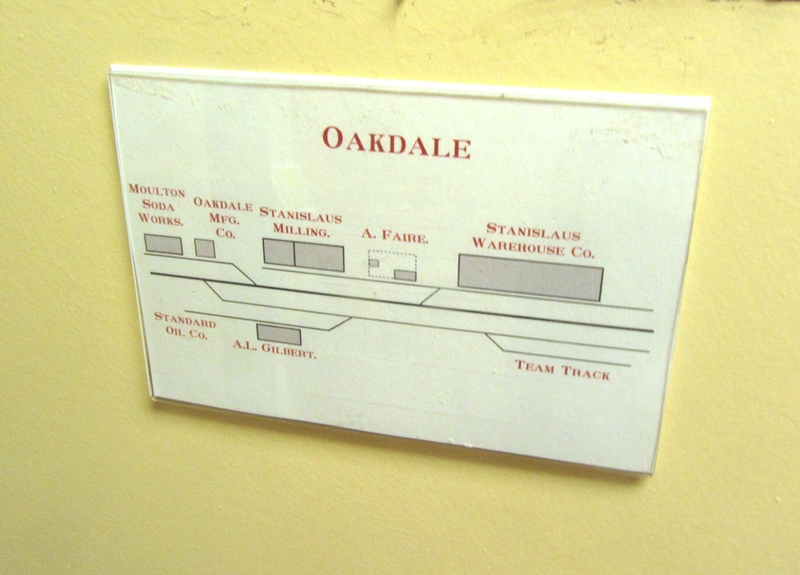 After all, there was a reason the town was named Oakdale. Positioned next to the fast clock and shelf, the plat can help visiting operators find the industries they want. 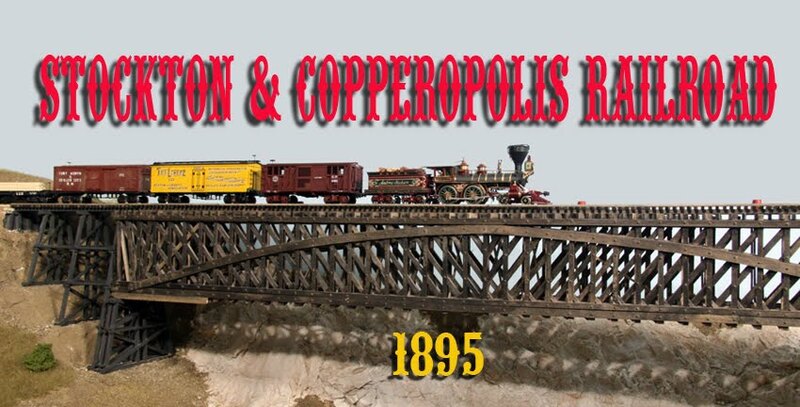 The Stockton & Copperopolis has been operating now for over four years with minimal on-layout help for operators. I had made up some tent cards and placed them at industrial sidings but the crews still had to search to find the right siding (Unfortunately, those cards will remain until the industry they represent is built). 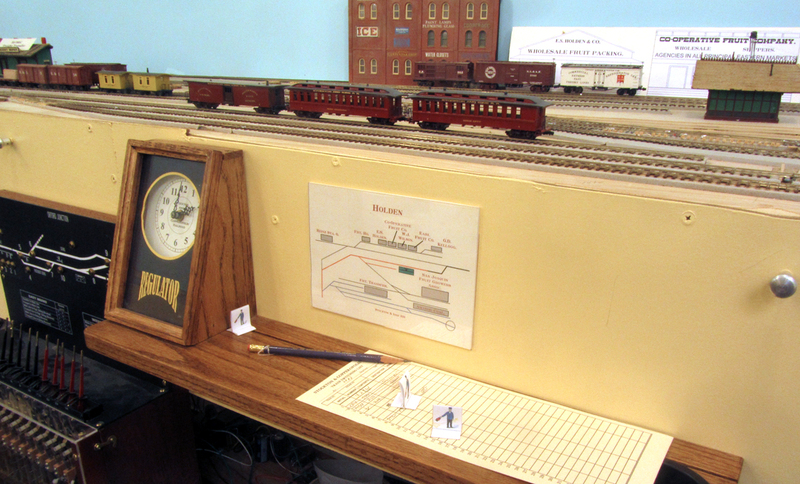 A couple of years ago, I printed out portions of my layout plan and placed them at switching locations to give operators a better view of things but blue masking tape holding up copy paper didn't really look that great. 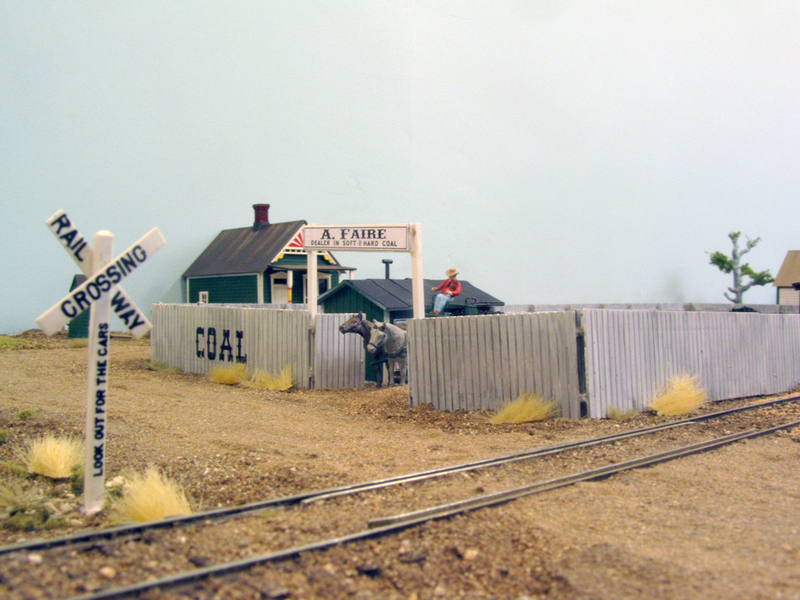 I wanted something that looked professional but could be easily changed if I added a siding or industry.While operating on Dave Acheson's layout last weekend, I noticed the signs he had and asked him about them. They looked good and met my requirements so I decided to incorporate them on the S&C. 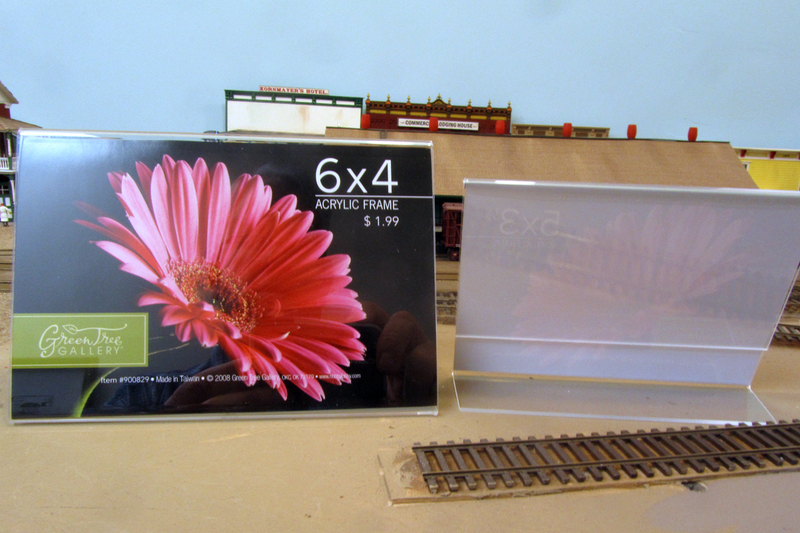 Acrylic picture frames are the foundation of the S&C's station plats. The rear stand must be removed so that the frame can lay flat on the fascia. 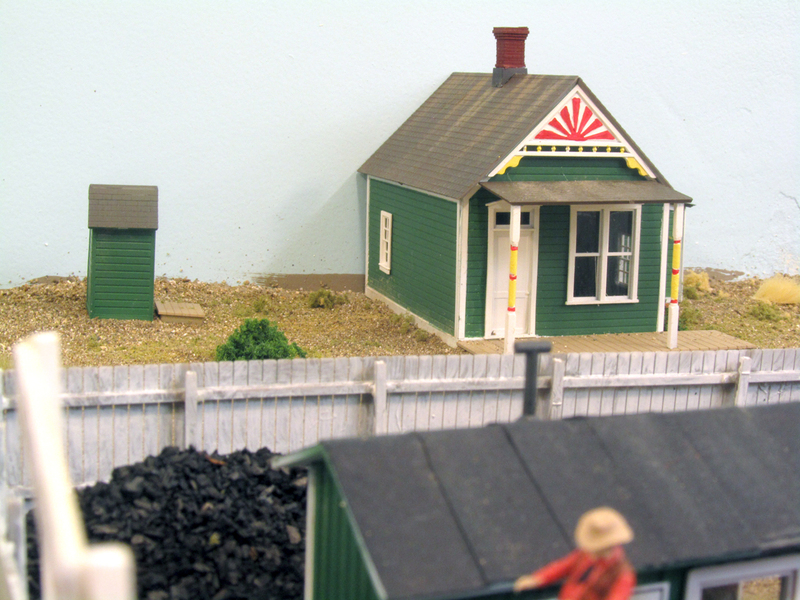 The basis of the station plats (so the prototype called these small maps) is a series of acrylic picture frames made by Green Tree Gallery. I bought mine at the local Hobby Lobby (www.hobbylobby.com). They come in several sizes and orientations. I used the 5 x 3-1/2, the 6 x 4 and the 7 x 5 frames. This one-piece frame has a built-in stand which is not need so I sawed it off using my table saw. This gave me a flat frame which was then attached to the layout fascia with double-sided tape. Using Adobe Illustrator, I drew up some better-looking plats sized to fit the frames and am quite pleased with the results. In my eyes anyway, they add to the railroad and, hopefully, the ease of its operation. The finished plat gives the relative location of the industries at each switching location.